What Can Watt-Ahh® do for me? All products, written information, testimonials and other statements provided on this website have not been evaluated by the Food and Drug Administration. These products are not intended to diagnose, treat, cure or prevent any disease. For all health concerns, please consult with an appropriate licensed healthcare practitioner. For informational purposes only, products, services and research performed by other businesses, organizations and individuals may be referenced on this website from time to time and are not necessarily endorsed by either AquaNew, LLC or its corporate officers. © 2019 AquaNew, L.L.C. All rights reserved. Watt-Ahh® and AquaNew® are U.S. registered trademarks of AquaNew, L.L.C. View the latest Video featuring our Be the Ahh! Champions. For the most current information about Watt-Ahh® Subscribe to our newsletter. What is Watt-Ahh®, an AquaNew® Water? AquaNew’s Watt-Ahh® or “Polarized Water” is different at its molecular basis and – consequently – in its own exclusive category when compared to other types of water. The stable dioxytetrahydride molecule (two co-valent bonded oxygen and four hydrogen) is a crystalline-like structure enriched with electrons. Negatively charged electrons (or polarization) reduce surface tension and clustering of water molecules for cellular absorption and in preventing the clumping of blood. Polarized Water is the best ingredient for improving the efficacy of any product, including water purification, food production, energy drinks, holistic health, wound care and cosmetics. AquaNew holds the exclusive license on the WIT Technology for non-medical consumable products and will sub-license to other product manufacturers. 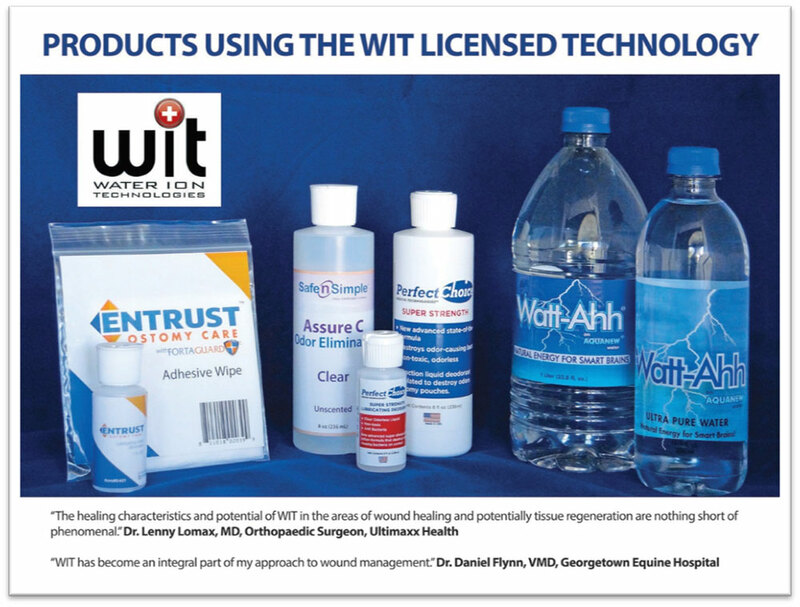 Pictured below are some of the licensed products available on the market using the WIT Technology (Polarized Water and Gas). More discussion on the proprietary technology and licensing can be found on the website for WIT International LLC by visiting www.WaterIonTechnologies.com. At AquaNew, we did not set out to create the best tasting water on the planet. We intended to create a solution that would promote the general health of all people and allow the body to heal diseases without the side affects of modern medicine. As scientists, we are concerned that so little attention is paid to the byproducts of reactions that take place within the body. Modern medicines bring about needed reactions, but the byproducts of these reactions create unintended side effects that are, in many cases, worse than the original problem. Our intent was to utilize modern science to restructure the water molecule to neutralize free radicals, penetrate cellular walls (effectively washing away toxic byproducts), and allow the body to heal itself the way nature intended. As most people know, the FDA must approve any claims made by a product regarding health. This requires years and millions of dollars to be invested before the product can be marketed to those who need it most. As a result of these regulations, we make no claims regarding Watt-Ahh®. Instead, we supply you with testimonials from real people, scientific information in a language that you'll understand, and historical facts that you'll appreciate, so you can make your own decision about what's good for you. As stated earlier, we didn't set out to make the best tasting water on the planet, it just turned out that way. The AquaNew Purification Process involves multiple proven purification stages and a new patent pending stage for restructuring the molecular foundation of Water. The result is Watt-Ahh®, Ultra-pure Polarized Water, that has all of the benefits of pure water, plus additional treatments intended to provide good health and wellbeing. Read more about our elaborate 5-Stage Purification Process. You can also read about the availability of use licenses for the operation of the WIT Machines, used in many applications, by visiting www.WaterIonTechnologies.com. ORP is simply a measure of millivolts in a solution that reflect the potential for Redox reactions when the solution comes in contact with another substance. Redox is a well-known chemical term that stands for reduction-oxidation reactions; or, to make it simple, a positive or negative reaction. A negative ORP reading indicates it will promote bacterial growth, and a positive ORP reading indicates it will prevent bacterial growth. Both characteristics are needed when dealing with water. For example, when we are dealing with wastewater, such as sewage, we want to promote the growth of bacteria; therefore, we want a negative ORP reading. On the other hand, when we are dealing with drinking water, we want to prevent bacteria growth; therefore, we want a positive ORP reading. ORP measurements have become the standard test for municipal water suppliers in recent years, and have replaced tests such as chlorine and pH, due to increased accuracy involved in a ORP reading. A positive ORP reading is relevant for Watt-Ahh® pure water because it verifies its clean, antibacterial properties. The pH of pure water, including Watt-Ahh®, is within the range between low and mid 7.0. Any change in the pH of water is caused by mineral deposits suspended in the water. According to Scientists at the US Department of Energy (DOE), Molecular Biology Archive, normal blood pH is about 7.35. Blood pH lower than 7.0 or higher than 8.0 may cause severe medical complications. The DOE indicates that a severe upset in blood pH (<7.25) causes disturbances in the body, which can lead to renal failure. Acidosis may occur with blood pH below 7.0, which can cause a coma. For the other extreme, alkalosis causes the heart to beat too fast and can cause a heart attack. No one should attempt to adjust blood pH with a liquid product, including bottled water, since it gets into the blood stream too fast, gives a quick boost of energy because the heart is beating faster, and can cause heart damage or stroke. This is what happens when someone is bitten by a snake because the venom is alkaline. A small amount of alkaline water will neither harm the human body nor improve health. Alkaloids in fresh vegetables and juices safely boost blood pH. According to the DOE, there are a series of buffers which help the plasma resist any change in pH. Some of these include: the hemoglobin in the red blood cells, other plasma proteins, the bicarbonate buffer, and the phosphate buffer. Many physiological processes influence the pH, but one of the largest contributors is the CO2 content of the blood. Customer: I give Watt-Ahh® to my pets. Testimonials have shown that giving pets (dogs, cats, and birds, thus far) have exhibited improved health, more energy, and less illness, after consuming Watt-Ahh® for more than a week. You'll have to read some of the testimonials from pet owners to believe the amazing effects on their "animal family members". One of the testimonials described her arthritic "rescue dogs" as having increased mobility, and "puppy-like qualities" after only weeks of replacing their tap water with Watt-Ahh®. Customer: I use Watt-Ahh® to make my coffee and tea. Testimonials say that coffee and tea made with Watt-Ahh® never tasted better (In fact, you might just find your coffee maker to be cleaner, and brewing the most amazing coffee you've ever tasted!). Customer: I cook with Watt-Ahh®. You'll find that all "prepared food," tastes better with more enriched flavor when made with Watt-Ahh®. We spray fresh vegetables with Watt-Ahh® before bagging and storing, which increases their refrigerator life, and maintains their fresh crisp taste! Customer: I use Watt-Ahh® to mix with my daily fiber drink. The conversion of deionized or distilled water to "Hydro-fortified,” allows Watt-Ahh® to dissolve and distribute the fiber into water, and keeps it completely mixed. Those who have been taking daily fiber treatments using regular water won't go back after using Watt-Ahh®. (You'll have to get used to drinking it, without constantly stirring, which may be a let-down for those who love to stir!). Customer: I water my plants and garden with Watt-Ahh®. We encouraged our gardeners to blend our AquaNew® Water into fertilizer for more effective uptake of nutrients by their plants. They will see for themselves the growth benefits found with trees, plants, crops, and all growing things. We've had some amazing responses relative to the size and longevity of "greens" when Watt-Ahh® is introduced. In fact, even with hydroponic testing, we've been told that minimal bacteria, mold, or contaminants are found in the water storage containers, even after months of use. Customer: I notice that my cut flowers last longer in Watt-Ahh®. We noticed that blooms on individual flowers, and those in flower arrangements, stay open longer and fuller. The water seems to become less cloudy, and has a more pleasant smell, when Watt-Ahh® is used. Daily water change for cut flower arrangements is also a thing of the past. With Watt-Ahh®, an AquaNew® Water, the cut flowers don't require replacing the water daily to retain freshness. Customer: I keep Watt-Ahh® on my belt when working in the garden to arrest fire ant bites before they fester. One testimonial described how spraying Watt-Ahh® immediately on fire ant bites will stop the sting and itch, and will prevent the bite from festering or "bumping up," for more rapid healing. Customer: I use Watt-Ahh® as a disinfectant to clean my house. Although Watt-Ahh® is not marketed as such, scientific testing has shown that Watt-Ahh® won't bond with germs, bacteria, or microorganisms, thus flushing them from any surface that is cleaned with Watt-Ahh®. Testimonials have reported that entire homes can be cleaned, without chemicals, by simply using Watt-Ahh®! Customer: I spray/wash kitchen counters with Watt-Ahh®, and can clean while I'm cooking, without fear of chemical contaminants. We've heard and received many testimonials about how using Watt-Ahh® to clean kitchen counters, nurseries, bathrooms, and floors, provides a renewed sense of wellbeing to the homes of those concerned about living with chemical contaminants. You can spray Watt-Ahh® anywhere around food (or even on food) without being concerned about chemicals, like you would with most all cleansers on the market. Cleaning an entire nursery without bleach, or disinfectants, also provides a great sense of relief. Customer: I use Watt-Ahh® with my cleaning products and bleach. This is fine, assuming that you color test first. You can use Watt-Ahh® as you would any water when adding to other cleaning products. However, you may find your cleaning products working better. We have reports from customers that Watt-Ahh® cleans stainless steel as well, if not better, than other products on the market. Customer: I combine Watt-Ahh® and a household oxygenated cleanser for improved cleaning power. This is fine, assuming that you color test first. The only "unusual" reaction we've heard about thus far, is when adding Watt-Ahh® to such products as Oxi-Clean, the combination actually prompts a foaming action, whether it is being used in cleaning toilets, or other household areas, where an oxygenated cleanser would normally be used. This foaming action should not be of concern as it will only clean those areas where the foam reaches. Customer: I add Watt-Ahh® to my loads of laundry (about 3 cups to the wash and 4 cups to the rinse cycle). There are a number of reports about adding Watt-Ahh® to laundry. People find that they use less soap to clean the same sized load. We also received reports that using Watt-Ahh® in the rinse cycle removes significantly more contaminants, including pet hair, lint, and cloth fibers, in addition to the soap. Clothes are softer, fresher, and feel cleaner when Watt-Ahh® is used in the wash and/or rinse cycles. Customer: I use Watt-Ahh® in a spray bottle to remove eye makeup. Seeing is believing! Our initial test-market found that by simply filling a spray bottle with Watt-Ahh®, you can spray away your makeup without using chemical removers or soap. Watt-Ahh® hydrates on contact, and bonds with the oil based makeup to lift and remove it from the skin and eyelashes. Customer: I spray Watt-Ahh® in my ears and nose for cleaning. Yes. You'll find that cleaning your ears and nose have never been easier. Using a Q-Tip with Watt-Ahh® for ear cleaning provides results you never imagined. Since Watt-Ahh® won't bond with germs, bacteria or microorganisms, the Q-Tip will provide clear evidence of "what's been hiding in there." People who have used Watt-Ahh® as a spray-alternative to saline, find that clearing nasal passages is also a breeze! Customer: I gargle with Watt-Ahh® and mouthwash. Get rid of those nasty germs in the cleanest, freshest way ever. Using Watt-Ahh® in combination with regular mouthwash, also has unique and refreshing results as well (Can you say foamy?). Even regular toothpaste is enhanced by using Watt-Ahh® as the "wetting agent" when brushing. Customer: I spray Watt-Ahh® in my eyes after showering. We have received reports from our customers that they either spray or wipe their eyes with Watt-Ahh® to refresh and naturally hydrate, without using saline or eye drops to remove redness. Please make sure you only use Watt-Ahh® around your eyes as you would with regular water and without any additive that may cause eye irritation. Customer: My kids like to spray Watt-Ahh® after playing in the swimming pool, to see their fingers re-hydrate. People "accidentally" find uses for Watt-Ahh® every day. One woman entertained a group of children by letting them play with a spray bottle filled with Watt-Ahh® to watch them marvel at seeing their "shriveled fingers" getting plumped up again by instant contact with the Watt-Ahh®. Yes, we know this will not entertain the kids too long, and other party activities are recommended. Also spraying Watt-Ahh® on the skin after coming out of a chlorinated pool, or on a hot day, is indeed refreshing. Customer: I drink Watt-Ahh® for regularity. It makes sense that an individual with a healthy diet could experience improved metabolism with more regular elimination. We also receive reports of less bloating. Some of our customers report drinking Watt-Ahh® to ease indigestion problems. Customer: I drink Watt-Ahh® to flush toxins that remain after chemotherapy. The complete answer is unknown at this time. Based on testimonials from people diagnosed with cancer (including ovarian cancer and Hodgkin's Lymphoma) and subsequently treated with chemotherapy, system function improved and overall health was increased after only a few weeks of Watt-Ahh® consumption. In fact, treating doctors asked these individuals "what they were doing" to improve their organ and system functions while undergoing such harsh chemical treatment as chemotherapy. Granted, when the patients said, "we're drinking a new water," the doctors were incredulous. However, me must caution you to seek the advice of your licensed healthcare provider if you intend to consume Watt-Ahh® during or after chemotherapy. The chemicals should have sufficient residence time inside the body to fight cancer before flushing occurs, prior to initiating any detoxification treatment. Customer: I drink Watt-Ahh® to relieve the discomfort of arthritis. We have received a number of testimonials from customers who report less discomfort and more mobility in their joints after drinking Watt-Ahh®. We are of the opinion that Watt-Ahh® assists in removing free calcium that accumulates in joints; but again, please consult your licensed healthcare practitioner on any health related concerns. We do have testimonials from individuals with different types of arthritis reporting a fairly quick response in the alleviation of discomfort, swelling and stiffness. Although, after checking back with their rheumatoid physicians, were given no formal explanation for the change in condition. Customer: I use Watt-Ahh® as a topical antiseptic. Again, Watt-Ahh® is not being marketed as an antiseptic. Spraying Watt-Ahh® on insect bites, abrasions, cuts, and minor topical wounds, will provide immediate relief from discomfort, and could accelerate healing. Testimonials about the effects of Watt-Ahh® on sunburns, fire ant bites, scrapes, cuts, and acne, have provided positive and amazing results. Cuts and scrapes seem to heal faster, and without topical antibiotics; and, burns are soothed almost instantly upon contact with Watt-Ahh®. Medical testing continues in order to confirm these observations. Again, please consult your licensed healthcare practitioner should any healing complications occur. Customer: I fill my humidifier with Watt-Ahh® and run it at night to clear congestion. Testimonials include stories of humidifiers being filled with Watt-Ahh® to clear sinus congestion and breathing discomfort. Please visit our Testimonials page to read about, one woman who endured sleep disruption because of her cat's snoring. After using the humidifier filled with Watt-Ahh® for a few weeks, she realized that her cat wasn't wheezing or snoring any more. Customer: I started drinking Watt-Ahh® to help with detoxification, and ended up restoring proper kidney function to failing kidneys. People who introduce Watt-Ahh® to their daily fluid intake (some of whom are simply seeking to detoxify their bodies) have found improved kidney function, including one man who was told by his doctor that his kidneys were failing, only to be told that they were again fully-functional, after only two weeks of drinking Watt-Ahh®. Customer: I'm allergic to surgical tape, and found that Watt-Ahh® removed latex, and plastic/gum based tapes, without discomfort, and without removing the underlying hair. A testimonial from a man undergoing numerous biopsies, and drinking Watt-Ahh® for detoxification, found that he was ripping his skin when trying to remove the never-ending tape from his skin when coming home from the hospital. He was delighted to find that spraying Watt-Ahh® on the skin around the tape, and on the tape itself, allowed him to remove it from his skin without irritation, discomfort, or loss of hair. In fact, many have found they can use Watt-Ahh® to remove glue, tape and other adhesive substances from glass, plastic, and metals.